After 3 years and 250 classes, I've come to adore the ritual of the post-barre class shower. Working out hard, washing away the sweat, letting the hot water take the ache out of sore muscles—it's just the best! The kit I currently bring to barre contains natural and free-from skin and body care in travel-friendly sizes; they're products that are easy and quick but pack a bit of pampering into what's otherwise a straightforward post-workout shower. Now that I've committed to attending 36 classes over the next 90 days as part of the Fitness Challenge, I'll be toting this round-up of essentials to the studio much more often. I'm one of those obsessive types who has to shower immediately post-workout. Luckily for me though, the changing room facilities at my studio are clean and lovely, stocked with staples like towels and natural shampoo/conditioner/body wash/lotion. There are even hair dryers and straightening and curling irons. That means the only things I bring along are natural deodorant and some sort of body moisturizer. I've been using the Agent Nateur deodorant for almost a year now and still love it for the way it glides effortlessly when applied, doesn't irritate my underarms, and fights odour without having an overpowering scent. You can tell it's an old tube because all of the Instagram-friendly black lettering on the packaging has worn off completely. As for the argan oil, I could use the natural body lotion at the studio, but that's kept in the common changing room area and I like the relative privacy and convenience of applying body moisturizer while still in the shower stall. Plus, putting it on right after a shower locks moisture into skin much better. I've been a big fan of Leaves of Trees since BeautyMark introduced me to the Toronto-based brand. The pure unscented argan oil can be used on face, hair or body. Its dropper dispenser and compact brown apothecary-style bottle make for an easy application experience and a much more travel-friendly option than a big bottle of lotion. BeautyMark is sadly closing for good this March so you won't be able to buy this oil from them going forward, but if you visit them in the next few weeks you can stock up on remaining Leaves of Trees all-natural products at 15% off. Breaking up Fresh beauty gift sets is a smart way to stock your gym kit with travel-friendly versions of luxe skincare goodies that also happen to be free of sulfates, parabens, and phthalates. (The gift sets are on sale at Sephora while supplies last!) Fresh Soy Face Cleanser is one of my longtime faves for its soothing gel-like texture and delicious scent; it's perfect for cleansing a makeup-free sweaty face. Fresh Lotus Youth Preserve Eye Cream is just a basic eye cream suitable for all skin types. It doesn't do anything miraculous in terms of lightening dark circles, de-puffing, or reducing fine lines, but it moisturizes nicely and doesn't sting the sensitive eye area. Rocky Mountain Soap Company has mini versions of their most popular skincare including the Hydrating Toner ($13.50, previously featured here). This is my second go-around with the travel-size Hydrating Toner—I still enjoy its herb-y, slightly medicinal scent of frankincense and the way it lightly hydrates and refreshes the senses after cleansing. The spray nozzle produces an ultra-fine all-over mist that covers the entire face and neck area, thereby eliminating the need for cotton pads on the go. This product is also available as part of the Skin Care To Go set ($43) along with the Transformative Cleansing Oil and Pomegranate Day Cream. If you want to keep it simple and all-natural, these three products bundled together are a great value and should be sufficient for your post-workout skincare needs! Lastly, Olay Regenerist Luminous Facial Oil (previously featured here) is an oldie but a goodie I just can't seem to quit. This facial oil lasts ages and smells delicious thanks to some of the botanical oils in the blend, plus it's lightweight, absorbs quickly and has never clogged my pores or caused breakouts. I also like the fact that it's an affordable natural facial oil available at the drugstore level. This is my go-to face moisturizer post-workout right now as it's dark when I leave the studio and I don't need SPF, but as we head into the warmer months and the days get longer, I'll probably swap it out for something with built-in sun protection. I know to some gym-goers having a whole post-workout skincare routine may seem a bit silly, but as a beauty blogger/skincare junkie/barre addict, having this little self-care ritual to look forward to after a class makes the overall experience of exercising that much sweeter! Which brings me to the question: What's in your gym kit? Glad you enjoyed it! The Fresh eye cream and Olay facial oil are good skincare basics to have and return to. I love how you're using the little bag!! 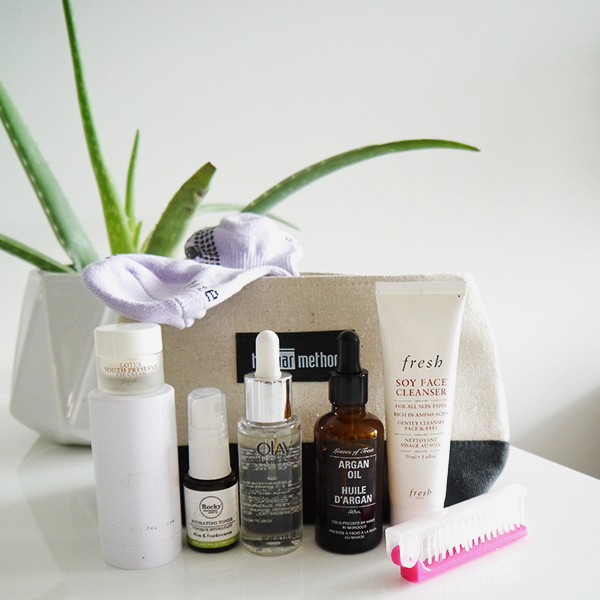 I actually only recently even bought a gym bag (was using random totes before) so I can finally start to pack a beauty bag for post-barre care! You're going to have to show me your new gym bag the next time we see each other!